CultureIQ is the leading global culture management company and helps organizations drive competitive advantage by aligning culture with strategic business objectives. 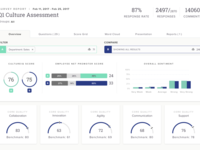 Powered by industry-leading strategists, flexible technology, and a validated research framework, CultureIQ makes whats good for people good for business. 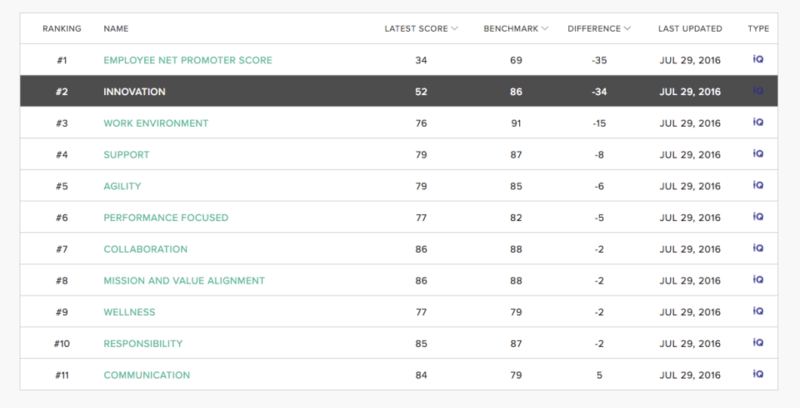 Overall: The dashboard of CultureIQ is clean and easy to read/understand. Also a bonus that they have pre-populated surveys to select from. I greatly dislike that there is no customer service number to call, and when I need assistance I have to fill out a request form online. It would be really helpful if we could have a file feed set up from our HRIS system into CIQ so i don't have to manually upload all new hires. Also, some surveys (like exit interview) i don't want to be anonymous, however when I asked about this i was discouraged to do so. I would like an option to be able to extend my survey if i choose. Thank you for taking the time to share your thoughts. We highly value all feedback so we can evolve to best serve our users. We want you to get the most out of our platform and take advantage of its ease of use. At this stage of our business we've determined that the online form is the most effective process for our team to be able to respond within 24 hours to general inquires, and suss out more time sensitive requests that require immediate support. As we grow, we're excited to continue to expand our accessibility and will consider this feedback as we prioritize process adjustments. If you'd ever like to extend your survey or send a non-anonymous survey ¿ like exit interviews ¿ please always feel free to reach out and our Account Management team will happily help you make those implementations. We appreciate your support and are happy to discuss in more detail. We've reached out personally if you'd like to set up time to connect. 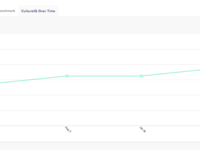 Overall: Very happy with CultureIQ overall, it's been rapidly adopted and helps us measure aspects of the company that are critical to business success but difficult to quantify. CultureIQ has based its model around research which made it easy to sell to our higher ups, and the team is constantly responding to enhancement and feature requests based on customer needs, and willing to help us tweak things to fit our particular needs. My only recommendations for improvement are to tighten up quality of service and expectation setting on when features will be rolled out. Hoping this improves as the company grows since they are small. The tool itself is fantastic and there's nothing like it out there, and is constantly improving, hence the overall recommend! Pros: I like that this tool helps us collect qualitative data and use it to improve performance. It ensures every decision is informed by research and this helps stir the organization in the right direction. It is convenient, user-friendly and quite helpful. You can use it to identify the strengths of your organization and the areas that need attention. Cons: I wish it offered a variety of customization features. There is nothing else I dislike about this tool. 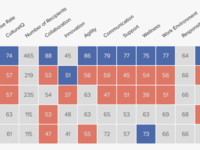 Overall: it is quite hard to identify the areas that need improvement in an organization. This tool solves this problem. You get deeper understanding of your organization culture and make relevant adjustments for better performance. The tool is undoubtedly part of our success story. Comments: I've been working in HR for about 6 years at big and small companies. Culture is at the core of everything HR processes and systems seek to address. There are tons of new HR tech sites budding these days and CIQ is one of a kind. The methodology/theory is thoughtfully designed so as to help educate HR/Biz leaders about how to view and develop their cultures. The passion and energy put into this product and technical functionality is unparalleled. Some HR tech systems, not to call names, were clearly built to work as needed nothing more or less. CIQ is elegantly designed to marry the insight behind the method with top notch tech touch, feel, and functionality. There are just enough features to enable creative utilization but not so many that you feel overwhelmed. This product is truly beautiful and not just easy, but fun to use. In a society full of tools and systems that compete for user time, this system fits the bill to make culture measurement and analysis easy, fun, and effective. Highly recommend! Comments: CultureIQ has been a valuable tool in our Engagement Toolbox. We are a dispersed team and the CulutreIQ surveys have enabled us to get the pulse of our organization, whether they are in our backyard or 3000 miles away. The tool to super easy to use, customizable and we can even use our own "EN Language" throughout. I love how we can dissect the reports a number of ways to allow us to dig into the details and pinpoint those areas where we need to celebrate and those areas that may need a bit more love and attention. In addition, I cannot say enough great things about the CultureIQ Team. They don't feel like a vendor but part of our team. They are always available to support us, they bring great ideas to the table and proactively check-in with us to see how they can support. CultureIQ Rocks! Comments: We've been using CultureIQ for almost 3 years and have continued to reap a huge return on the investment. The software itself is really easy to use, and includes tons of templates so you're not starting from scratch. They have great bench marking data as well, so you can see how you compare to others using their tool. Really helpful excel exports of scores, trends and response percentages, and a tool to create a presentation of all the results in minutes instead of hours! Support has always been really responsive, and has even helped me connect with other companies of similar size and ratings to network and share successes. Cons: You cannot do much customizing without asking Culture IQ to do it on the backend. Overall: This has been a great upgrade from free survey tools. It is helping us streamline & create a culture of great feedback processes much more easily than ever before. Comments: I give the CultureIQ team top box ratings on all attributes! In my career, I've worked with many survey providers and platforms. The CultureIQ team and platform was, by far, the best I have ever worked with. Extremely easy, effortless, and efficient. I love the dashboard and being able to real time monitor results as well as being able to easily slice and dice the results to different views. I definitely recommend the CultureIQ team. A shout out to Erin for making the experience the best! Thank you. Comments: We have partnered with Culture IQ as part of their pilot program and they have helped us achieve success in our Core Values and alignment with the team around those values. Their events have been valuable for networking as well as informative. Their employees are truly engaged in helping you achieve success and always available for discussion when needed. Our culture is very important to the success of our company and Culture IQ and the entire team has been a great partner. Overall: I love Culture IQ! Some of our best feedback is a result of our quarterly surveys. It is easy to administer and the ability to customize (vs. a canned survey over and over) is what really differentiates it for me! Pros: Ease in creating site specific results. Overall: CultureIQ provided a very easy and cost effective means of assessing our company culture. We were able to generate numerous reports and benchmark our data. 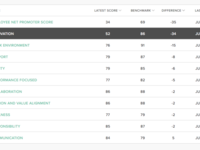 Using the reports as well as a summary provided by the CultureIQ team, we were able to quickly identify gaps and develop tactical actions to begin our journey to improve our culture. Recommendations to other buyers: I recommend the product. The CultureIQ team is high energy and fantastic! 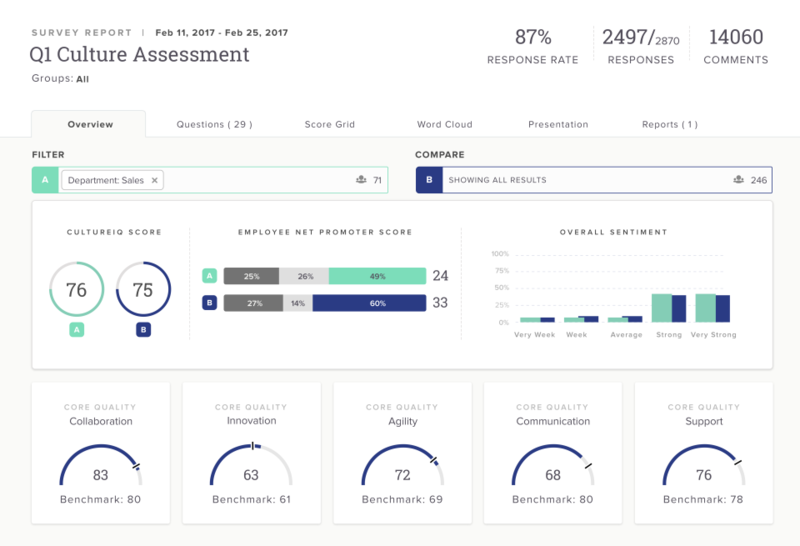 Overall: Have used CultureIQ several times, it provides great insight on how employees feel about the company and work environment.